At the heart of every business are the people who make it work. That’s why human-centered design, 2018’s latest trend for commercial office furniture, is a welcome, if not long-overdue shift. It’s a concept based on not only productivity, but also the well-being and comfort of employees. And why not? With the American Productivity and Quality Center reporting that 56 percent of employees are stuck in cubicles or closed-door offices and the Gensler Research Institute showing that poor workplace design costs an estimated $330 billion in lost productivity per year, it seems a link has finally been made. Building on the popularity of the open floor plan to promote collaboration and innovation in recent years, human-centered design takes it a step further to create an environment where employees also feel energized, inspired and — dare we say — where they want to work. Imagine the productivity benefits. How will work NOT get done? The human-centered design trend is all about encouraging movement and engagement. Being stuck at a desk all day doesn’t exactly fit that bill. 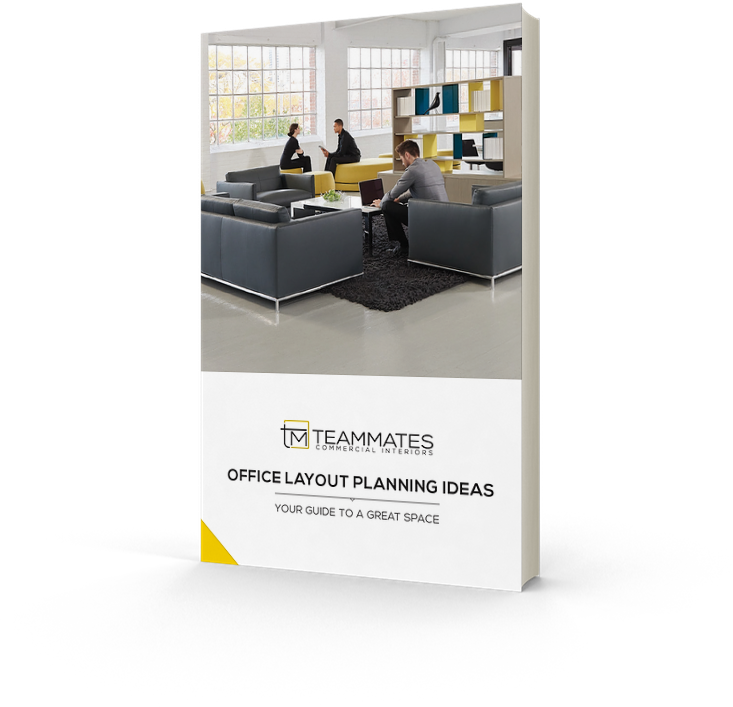 Give employees options to work in spaces that fit the task at hand. Incorporate breakout areas or huddle rooms, reconfigurable room dividers and partitions, sitting areas with sofas, comfy chairs and coffee tables or even bring in larger desks where two or more people can work together. Whether it’s ports everywhere or smartboards, make sure to equip all these spaces with the technology necessary to help employees be their most productive. Functional pieces, like Clarus’ go! 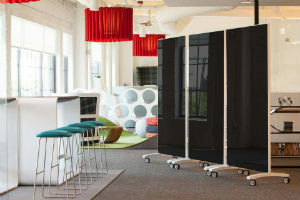 Mobile glassboards, allow employees to transform any area into a collaborative workspace. Home sweet home; it’s where we’re all most comfortable and less stressed. So, it makes perfect sense that human-centered design strives to recreate that ‘at home’ feel in the office to get the creative juices flowing. Ideas here run the gamut from gyms, meditation areas, outdoor space and game rooms to using colors known to improve mood, creating access to more natural light, and incorporating ambient lighting options. 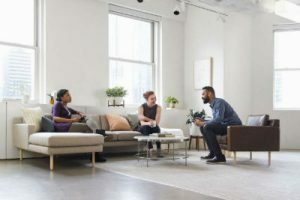 Lounge areas and community spaces that channel a homey, inviting feel help employees feel less stressed in the workplace. OFS’ Rowen collection pictured. Health and wellness is a key to the human-centered design trend. Unhealthy employees cost businesses big in time away from the office. But it’s also the productivity lost in being disengaged and uncomfortable while they’re working as well. Combat this by using adjustable desks and tables, ergonomic chairs, and by offering options that encourage healthy physical activity and food choices at work. Sit-stand desk solutions, like HumanScale’s QuickStand adjustable desk solutions, are one way to give employees flexible wellness options in the workplace. 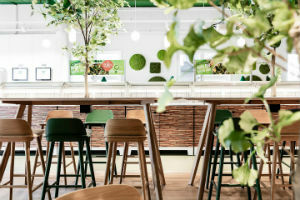 Known as biophilic design, weaving the forms, textures and patterns of nature into your workspace is a trend in and of itself with WELL and LEED certifications become increasingly popular. It uses our connection with nature to bring about a sense of calm in the office, and the natural elements offer health benefits as well. It also fits beautifully into the human-centered concept. We’re talking about more than a few plants here; think water features, room dividers and furniture made of natural materials, textured surfaces and even artwork that brings the outside in. Nordgrona’s Reindeer Moss panels coupled with natural wooden textures create a unique environment that brings the beauty of the outdoors in. Come take a look at some of these commercial office furniture trends in person. Book a tour of our showroom and enjoy a free design consultation with us or download our free office space planning guide for more tips ‘n’ tricks on planning your office space.